Sunday, June 15 sees the wrap of the fourth, and arguably bloodiest season of HBO’s hit fantasy drama Game of Thrones. And based upon previous seasons finales, there’s a good chance that the dragons, giants, supernatural White Walkers and the ongoing battle for the Iron Throne will result in a bloodbath of epic proportions. As the season draws to a close, let’s take a look back at the series of magical brews that Cooperstown, NY-based Brewery Ommegang has developed in conjunction with the show’s producers. The first of course was Iron Throne Blonde Ale, which began shipping ahead of GOT’s third season premiere after debuting at Austin’s SXSW. Next up came Take the Black Stout, a darker and bolder Belgian dark ale inspired by the show’s Night’s Watch. It was brewed with caramel, chocolate and roasted barley malts, hopped with Northern Brewer hops, and spiced with licorice and star anise. Drink Nation tasters liked its “welcoming light malty scent,” “mellow rich” flavor and “lightly sweet” finish. 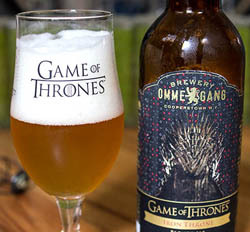 Coming up in Fall 2014, Brewery Ommegang will debut Valar Morghulis, a fan-sourced Abbey Dubbel style ale that the show’s faithful watchers voted on both style and the name, which in the world of Westeros means “all men must die.” Here’s hoping they mean dying to drink it.